Jeju beach guide for 2017Beach season on Jeju has officially started! 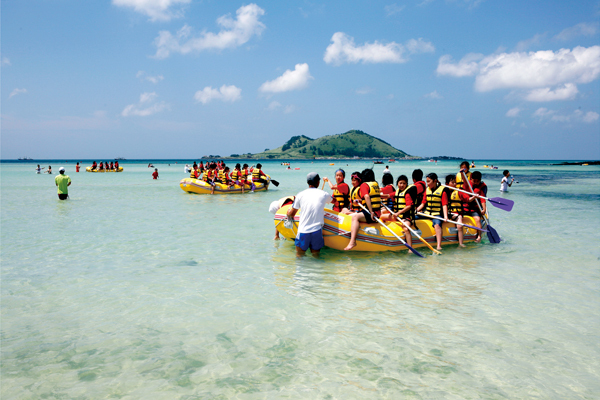 Jeju is well known for its beautiful beaches and they are popular with tourists throughout the year. However, during summer things step up a notch as tourists and locals alike aim to make the most of the hot summer weather. Because of this, during summer Jeju's most popular beaches open up extra facilities to help make people's visit to the beach extra comfortable and safe. They do this by opening up showers and also by bringing lifeguards and more food and drink options to the beach. 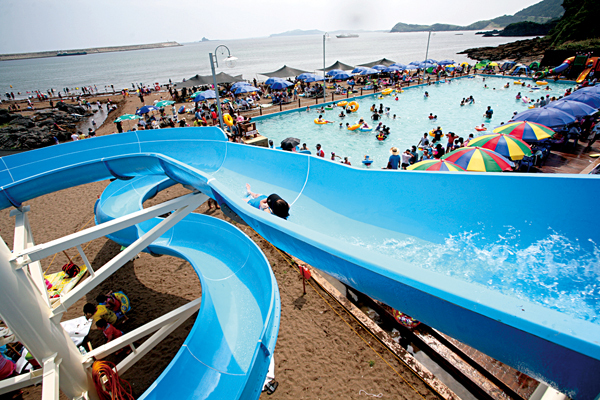 This year, eleven beaches across Jeju will have these extra facilities available from 10am till 7pm until Aug. 31. As well as this, from July 15 till Aug. 15, facilities at four of Jeju's most popular beaches (Hyeopjae Beach, Samyang Beach, Hamdeok Beach, and Iho Taewoo Beach) will stay open till 9pm. Please scroll down for a map of all the beaches. Hyeopjae is often considered to be one of Jeju's most beautiful beaches. It's white sand, turquoise sea, and views of Biyangdo Island ensure its popularity amongst beach goers. As well as its undoubted beauty, the water at the beach is generally very shallow which makes it a great place for families to come swimming with their children. While not the quietest beach in summer, a bit of peace can be found by walking west towards the second beach on our list, Geunneung Beach. Geeunmeung Beach offers the same white sand, turquoise sea, and views of Biyanddo Island as Hyeopjae Beach, but without quite as many people. There is a large carpark and an excellent campsite can be found between Geumneung and Hyeopjae. If you are looking to add something else to your day, Hallim Park is very close by. Gwakji Beach is a favorite amongst locals that has started to gain in popularity over the past few years. While this means it can get crowded, the vast expanse of space found at Gwakji means that there is generally always somewhere to lay your towel. Iho Taewoo Beach's strongest point is its proximity to the city. In fact, visitors flying into the airport could be at Iho Taewoo Beach in around 15 to 20 minutes by car or 30 minutes by bus. As well as this, for those who want to play in the water but perhaps aren't the strongest swimmers, Iho Taewoo Beach also has an outdoor swimming pool so that everyone can get a chance to have fun in the water. Heading out east now and the first beach you will come to is Samyang. Known for its striking black sand as well as its proximity to the city, Samyang is a great stop off for those looking for something a bit different. As well as this, Samyang Beach is the perfect place for windsurfing so if watersports are your thing, be sure to check out Samyang Beach. 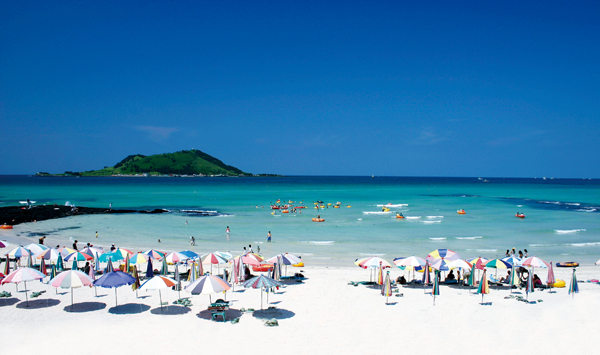 Like Hyeopjae and Gwakji Beach above, Hamdeok Beach is a white sand, turquoise water paradise. 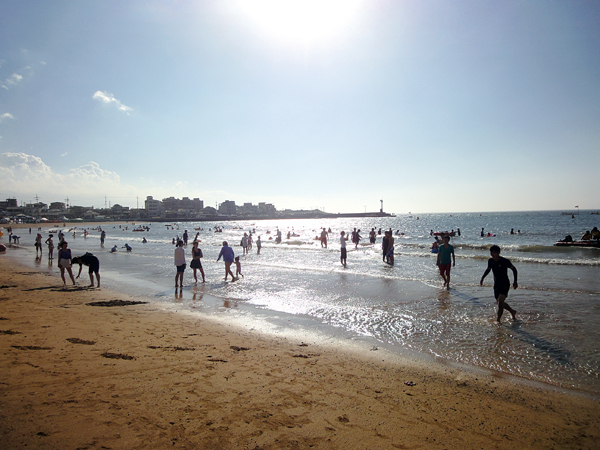 However, unlike these beaches, Hamdeok can be reached from Jeju City Bus Terminal in little over 30 minutes. If you visit Hamdeok Beach be sure to check out the hidden smaller part of the beach just to the west of the main strip. Also, if you want a bit of exercise to break up all the relaxing on the beach, Seoubong Oreum is right next door and is very accessible. Next along the western coast is Gimyeong Beach. While perhaps a little smaller than some of the other beaches on this list, it is still worth a visit due to the dramatic contrasts between the pure white sand, striking black volcanic rock, and crystal clear ocean. Jungmun Beach is massively popular due to the number of resorts nearby in Jungmun Tourism Complex as well as its beautiful golden sand and tropical looking location. It is also popular amongst surfers due to its deeper water and waves that aren't found at many of the other beaches on this list. Pyeoseon Beach is actually the largest beach on this list with a total area of 150,000m2. While this may put an image in your mind of untouched sand stretching along a coast, the reality is a little different, although no less dramatic. Situated in a bay, as the tide goes out the beach expands into a giant circular playground. 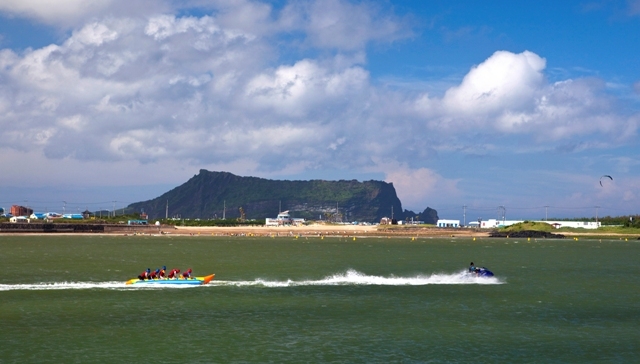 Hwansun Beach is situated right next door to one of Jeju's most famous sights, Mt. Sanbangsan. It is a golden sand beach that, much like Iho Beach, also features an outdoor swimming pool. Another Beach located near to one of Jeju's most famous spots, Sinyang Seopji Beach is in a bay that has views of Sunrise Peak and Seopjikoji. Not as popular as some of the other beaches on the list, it is nonetheless well worth a look for people staying nearby due to its golden sand. 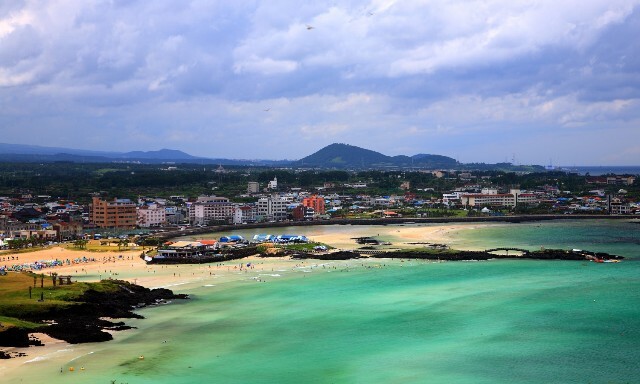 Of course, as well as the beaches on this list, Jeju has no shortage of other smaller beaches dotted around the island. While they may not have the same facilities available, they all do have the same Jeju charm. Be sure to keep an eye out near the coast and you never know what you might find!